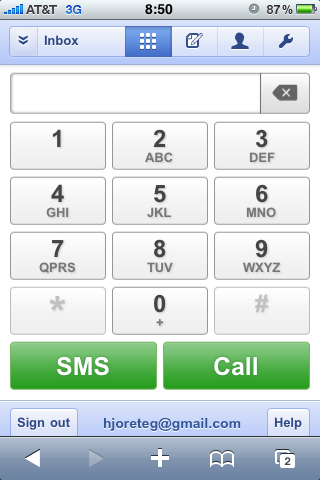 Google just built a sweet mobile version of Google voice for iPhone. I have but one complaint about all the awesome HTML5 mobile webapps that Google has been releasing lately. That means that each time I want to access it even if I save a shortcut to my homescreen on the iPhone it opens in a new window in Safari. This gets annoying in a hurry and actually stops me from using the other mobile web apps like Gmail from my phone (I use the built in mail program instead). The silly thing is this is sooooo easy to fix! Problem solved, now if I saved it to my homescreen it would open as if it were a stand-alone application. Why Google, why? There must be a reason, but it makes no sense to me.